The awe and pathos of fire over an Australian landscape might be too much for art at a time like this, raw and smouldering, enough nerves are on show that poeticizing it could verge on obscene. 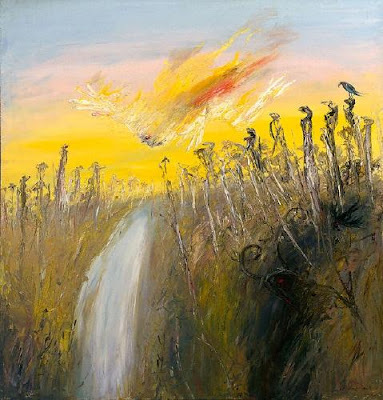 Arthur Boyd's 'Nebuchadnezzar on Fire Falling Over A Waterfall', in the AGNSW, is often on my mind, more so now than ever. It might be my favourite Australian painting, the one that I never leave the gallery without seeing, the one that I might willingly swap for the art on my walls. Hypotheticals allow us to be frivolous, but the many layers of the painting, landscape, drama or allegory, mean that it could fill the space of meaning left by many others. The scraggy surface, paint pulled and peeled, of those paperbarks, their bone white wood standing defiantly atop the escarpment from where the water falls place the scene in the outback. Between the trees the cataract breaks through in a spray of precious white water, the contrast rather than the solution to the Babylonian's blazing flight and above the bruised sunset is broken by a wound of red and white, Nebuchadnezzar's re-entry. The surface glows like the Australian evening so that this could merely be glorious reportage, but its mythologised king signals something universal in his fall. Nebuchadnezzar is surely not everyman but here he flies in flame between the earth and the sky, air and fire, between man and deity and in doing so he reminds us of what is glorious and vulnerable. But for him it was not an important failure"
Like Auden and Bruegel before him Boyd knows that the greatest part of human tragedy is that despite the promacy our own consciousness sometimes no one sees us fall and realising that opens a door on a particular kind of horror. Boyd painted the work Nebuchadnezzar series in England between 1966 and 1968. The burning flesh of Vietnam was at the front of his mind, and it might not be coincidence that here it is the king of our first great civilisation who rockets to the ground. Whilst this is far too good a painting to easily accept a single metaphorical interpretation the folly of man set against eternal nature is never too far from the surface. That leads to the second clear parallel, that of Icarus, the poster-boy for hubris thwarted. Perhaps the Victorian bushfires make us that sense of futility before nature all the more acute, whilst we attempt to engineer the economy our very world engulfs us. Icarus's death does not come without his momentary glory, he does indeed fly and that soaring is where the story crosses from cautionary to tragic. The next time I'm in the Gallery again I know I will stop and spend some time with Nebuchadnezzar, the topography of his painted surface, that one red eye and that bloody crow mean that I will see more stories and more sunsets even as I wish that for once he never combusted but continued to ascend.